During a security test lab I have encountered some problems to get connection up…every time I try to connect to SSH or HTTP or HTTPS hosts a “Reset by peer” occurred. Some others testers experienced the same problem and we start to investigate the issue. First of all we had three hosts with same mac address: aa:00:04:00:0a:04. The DHCP server assign the same IP all over the hosts…..and it’s correct due the same MAC Address !!! So we start to check Network-Manager parameters and /etc/network/interfaces file but every config was OK. In order to finish tests we have changed our MAC Address using ifconfig command and requesting a new IP from DHCP server. Why eth0 Mac Address was fixed on aa:00:04:00:0a:04 ??? Why Network-Manager adds other two Auto eth0 connections ? The answer is: DECNet libraries and tools !!!!! During activities we have installed some tools with DECNet dependency. Solution: in order to fix the MAC Address problem, click on System -> Administration -> Synaptic Package Manager. Now search for DECNet packages and mark for Complete Removal the following packages: libdnet, libdnet-dev, dnet-common and (optionally if you have) dnet-progs. At the end of removal process reboot your PC and checks the correct MAC address applied on eth0. Do you have a PIN code on your iPhone? 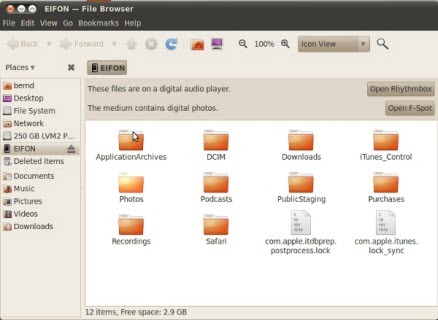 Well, while that might protect you from someone making a call or fiddling with your apps, it doesn’t prevent access to your data as long as the person doing the snooping around is using Ubuntu Lucid Lynx 10.04. I uncovered a data protection vulnerability , which I could reproduce on 3 other non jail broken 3GS iPhones (MC 131B, MC132B) with different iPhone OS versions installed (3.1.3-7E18 modem firmware 05.12.01 and version 3.1.2 -7D11, modem 05.11.07) , all PIN code protected which means the vulnerability bypasses authentication for various data where people most likely rely on data protection through encryption and do not expect that authentication is not in place. This data protection flaw exposes music, photos, videos, podcasts, voice recordings, Google safe browsing database, game content by in my opinion the quickest compromising read/write access discovered so far, without leaving any track record by the attacker. It’s about to imagine how many enterprises (e.g. Fortune 100) actually do rely on the expectation that their iPhone 3GS whole content is protected by encryption with an PIN code based authentication in place to unlock it. This, quite honestly, is a staggering flaw. It basically allows anyone capable of driving a Linux PC to copy data off of an iPhone without the owner of the phone having any idea whatsoever that this has happened. What’s more worrying is that Marienfeldt and Herbeck think that write access to the iPhone is only a buffer overflow away, which means serious access.